Escape to your very own forest hideaway at Tummel Valley. Unwind in lush surroundings, where the only sounds you’ll hear are birdsong and the gentle trickle of the river. Where your only commitment is to rest and your time is yours to spend as you please – whether that’s climbing mountains or just lazing in a silent glen. This is what real relaxation feels like. Set on the banks of the River Tummel within the Tay Forest, few places fulfil your need for the great outdoors like Tummel Valley. So just picture escaping there, to your very own luxury lodge, whenever you feel the need to get away. Immerse yourself in Scotland’s great outdoors. From time spent hiking amongst spellbinding scenery to an evening’s stargazing. 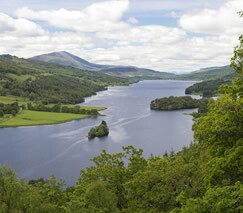 Let life’s challenges drift away in Tummel Valley’s leafy, riverside setting. Fishing, cycling, climbing, golf, hiking… this is a region overflowing with outdoor pursuits. After an action-packed day take a long blissful swim in the heated indoor pool, there’s a splash pool for tots too. From alfresco dining on the deck, to evenings tucked away in snug surroundings, your luxury lodge is the ideal year-round retreat.